One aspect of the STEPPING UP project involves modelling the choices and behaviours of ‘agents’ (people, organisations, businesses and government) across the UK in response to innovations across the Water-Energy-Food nexus and a changing climate. 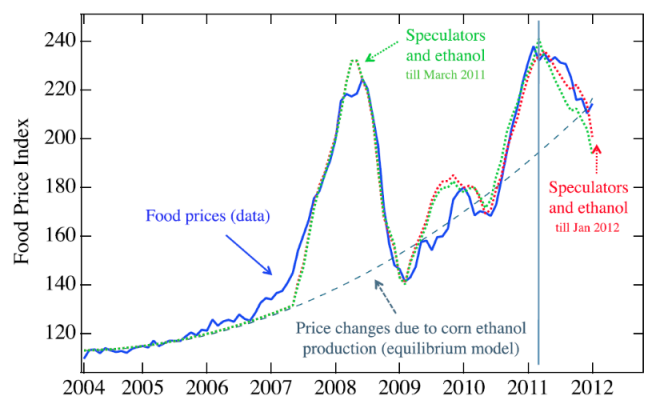 A recent paper published in PNAS has shown how increased use of food resources to produce ethanol for energy, coupled with food market speculation, led to rapid rises in the price of food around the world, social instability, the Arab Spring and even the ongoing war in Syria. You can read a more detailed analysis of the paper here.